Thanks God for seeing us through another week. And thank God for weekends! This weekend, I'm planning on getting a head start on Eliana's birthday. Yes, this little girl of mine is 11 months tomorrow and a year next month. We're having a little celebration at home for her with some close friends. Well, the planning stared out a little, now it's more mid-size. lol. Hubby and I decided early on that we're not going all out big birthday party for her first. We'll reserve that till she's old enough to know what's going on and actually enjoy the party herself. There's something on my calendar every weekend between now and then so the plan is to get as much done as I can this weekend. We'll see how that goes. Even though it's a small, ok medium-size house party, I still want it to be nice and fun. The theme is Cupcakes & Pastel colors (Our Cupcake is Turning One!). I think I'm getting more excited about her turning The Big One, the party and everything as it gets closer. Oh and you know how I raved about "my shows" a long time ago on here and how I don't miss them for anything and look forward to each one. Well, I sort of stopped watching everything all together when I returned to work after my maternity leave. After postponing catching up week after week, I just gave up and had no interest anymore. So, I haven't been watching or wanting to watch any show since then even when I had the free time. Long story short, all that ended last night. Out of nowhere I picked up the remote and started binge watching The Good Wife. I had to start with one that I know will hold my interest and it sure didn't disappoint. Might pick up on Parenthood after catching up on The Good Wife. It's no new news that maxi skirts are comfortable and refreshing. 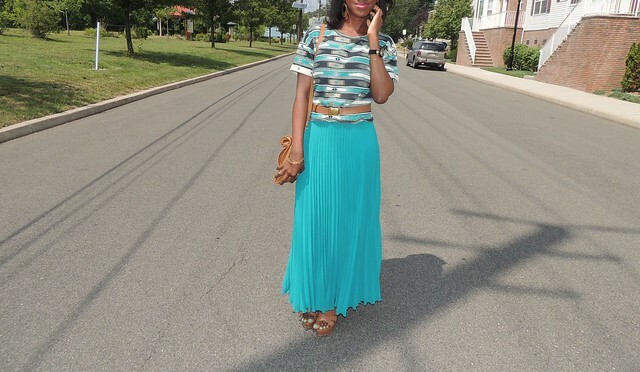 Couple Sundays ago when I wasn't feeling so dressy, I opted for this pleated maxi skirt. Staying with the same color tone, paired it with this tribal inspired crop top and added some brown accessories. Easy, free and relaxed. Just how I want tonight to be before I start my running around tomorrow.